We’d love your help. Let us know what’s wrong with this preview of A Wolf in the Dark by S.E. Turner. They say there are no such things as monsters.....but they are wrong.....very wrong. When General Domitrius Corbulo launches a brutal attack on Castle Dru in Durundal, he is intent on seizing the Seal of Kings for his master. Though with the aid of the Imperial Army, he slaughters everyone inside, including the king and queen. In terror, the young Prince Lyall escapes through an ancient, disused tunnel. Now, he has to confront his fears, knowing that he can never go back to his ancestral home, and what lies ahead will change his life forever. To ask other readers questions about A Wolf in the Dark, please sign up. Rather than being a sequel to 'A Hare In The Wilderness', this is the parallel story that converges in some places with the first book, although is never repetitive as it is told from a completely different perspective. Once again, Turner explores themes of human nature, perseverance and overcoming in this action-packed story which is as original as its companion volume. While there are certainly moments filled with despair and fear, the author focuses the reader An action-packed fantasy story. Once again, Turner explores themes of human nature, perseverance and overcoming in this action-packed story which is as original as its companion volume. While there are certainly moments filled with despair and fear, the author focuses the reader on the positive mental strength and determination of the lead characters in enabling them to endure their trials. Unlike the first instalment of the story, a good deal of the action of this story takes place at court, answering some of the readers' questions and heightening their involvement in both levels of the story. Once again, the story is full of engaging and likeable characters, along with a few who are easy to detest, while the occasional blurring of those boundaries makes the story even more interesting. While the most cetral character is male, there is also a very strong and resourceful female lead character who personifies the qualities of loyalty and teamwork in a way that is inspiring for all readers. Something I really like to see in a story is people being united by their challenges and working together for good, regardless of gender, class or anything else that might divide them. The second in the series, it tells the events from “A Hare in the Wilderness” from the perspective of Prince Lyrall, who struggles to become king after his parents are killed by General Domitrius Corbulo. This one was just as fun to read and had an emotional payoff at the end. With more action-packed scenes and equally spellbinding imagery as book one, this book makes a create addition to this coming of age fantasy series. Can’t wait to read book three. As for me, A Wolf in the Dark is a beautiful tale about love and kindness, braveness and strength. It's about people who live in harmony with each other and the world around them. The book gave me a belief that people can live happily in a society build on friendship and mutual assistance. On the other side, the author tells an exciting story of adventures which kept me in suspense during the whole book. And of course, I have to notice that the descriptions of nature and castles are fantastic. I As for me, A Wolf in the Dark is a beautiful tale about love and kindness, braveness and strength. It's about people who live in harmony with each other and the world around them. The book gave me a belief that people can live happily in a society build on friendship and mutual assistance. On the other side, the author tells an exciting story of adventures which kept me in suspense during the whole book. And of course, I have to notice that the descriptions of nature and castles are fantastic. I almost saw the pictures which author described, and, what's even more important, the descriptions are not boring nor annoying! A Wolf in the Dark is a coming of age fantasy book, that takes place in another world. It is about a teenage boy, Lyrall. Lyrall's father was a king who taught him courage and preparedness. His teachings came in handy as one night, a general and his army came to Lyrall's home, killing his parents and destroying his home, but not before Lyrall escaped. Though he was now an orphan, Lyrall found refuge with a clan not too far from his home. 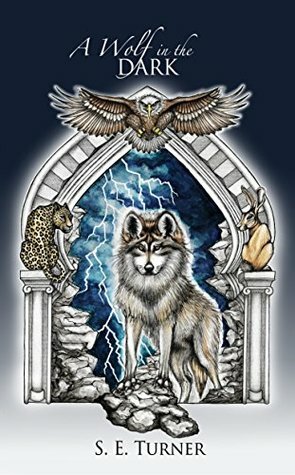 However, someone in this clan knows a secret about Lyrall A Wolf in the Dark is a coming of age fantasy book, that takes place in another world. It is about a teenage boy, Lyrall. Lyrall's father was a king who taught him courage and preparedness. His teachings came in handy as one night, a general and his army came to Lyrall's home, killing his parents and destroying his home, but not before Lyrall escaped. Though he was now an orphan, Lyrall found refuge with a clan not too far from his home. However, someone in this clan knows a secret about Lyrall that he soon learns and it helps him find the strength he needs to take on the general. A Wolf in the Dark by S.E. Turner grabbed me at page one and never let go. A child’s nightmare comes true. Things get worse from there. Eloquent descriptions of the locale and events brought to mind vivid, flowing images of action and beautiful scenery. The characters were as human and driven by duty as any I have read elsewhere. A beautifully told coming of age tale. Fantasy, history, sword and sorcery, battles, apothecary (herbal medicines) spirituality, honour, betrayal, vengeance, hope and despair, relationships, the building of families, the destruction of clans and courts, moral dilemmas, voyages of discovery, journeys of body and soul, coming of age, love, strength, courage. The Kingdom of Durundal is foremost a series, and involves the same central characters throughout. The books can be read independently of each other - and can be read as stand alone. Certainly by Book Three - there are more dynamics and more themes - a rawness and a much darker side. However, to get the flow of the story - it is best to start at the beginning with 'A Hare in the Wilderness' and read through the story in order. That way, you understand how the characters develop - and how their lives interweave. S E Turner is a life-long enthusiast of epic fantasy that borders on the believable. With an abundance of research weaved through the pages, this promises to be a thrilling and immersive read. 'I loved this book. It grabs you into the story so much that you feel the grit on your face, the dirt between your toes, the sunshine on your face. It makes your heart wrench, your stomach twist and your head thinking about what's next. It has the emotions of life and yes I cried in a few parts. This is a great read that has trials, heart, and gusto. It's fantastic! !